Story of Chance Vought, a man who was introduced to aviation in 1910 at the age of 22 and his struggles to build a business. 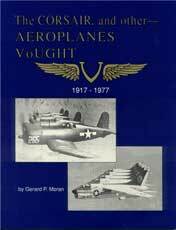 Vought's designs went on to great fame, breaking in to the highly specialized field of naval aviation. In 1926 Vought called their latest biplane Corsair and a name and heritage began. When WWII broke out, Vought responded to a Navy fighter need with the famed F4U Corsair, which went on to become the longest production type aircraft in aviation history. The Corsair became a legend during WWII. More than a story of Vought aircraft, book also delves into the human side, the management, the workers and the business climate through the years to the 1980's.